Comics and cartoons have a universal appeal. Most of us will happily peruse a colourful story, unfolding frame by frame in a comic or graphic novel format. In fact, many middle-aged mums and dads (like myself) might have begun our love of reading through such booklets. My mum used to buy myself and my siblings our weekly supply. We have fond memories of sharing (or fighting over) publications like ‘Bunty’, ‘Judy’, ‘Jackie’ or ‘Victor’. Alternatively ’The Dandy’ and ‘Beano’ were full of mischievous colourful characters for the slightly younger age group. I’ve always liked comics and their whacky cartoon creations – Denis the Menace, Tom & Jerry, Garfield – you name it – I’ve loved to doodle them, read about or watch similar type characters on TV. Now in adulthood as a working illustrator and art teacher I’ve even developed a ‘comic’ style in my own caricature work in capturing the fun and personality of the client, and I like to share the joy of cartoon drawing in my art classes. A while back, I heard about a Comic Book group in Cork. Sure enough, Google informed that the Cork Comic Creators meet up on the last Monday of each month (now 8pm in the Comic Vault in Lower Oliver Plunkett Street). It’s a gathering for anyone interested in creating comics, usually featuring talks about various aspects such as script-writing, lettering, artwork, and even offering feedback and advice on your work. I went along. At the time, the meetings were held upstairs in The Roundy House pub. I grabbed a seat and sat at the back. Emmet O’Brien and Colin O’Mahony of Turncoat Press, the Cork indie comic-publishing house, gave a presentation, beginning with a quote from American comic book writer Harvey Pekar “Comics are just words and pictures. You can do anything with words and pictures.” “In creating comics,” Emmet explained, “The following skills are needed – writer, artist, colourist and letterer”. Wow! There was I, thinking that in the world of Marvel or DC comics, all these tasks would typically be done by one person. Emmet showed examples of panels (the individual picture frames per story), speech bubbles and caption boxes. Five panels is usual but seven panels would generally be the maximum number per page. Emmet’s advice to writers of this genre is that you are writing firstly for the ARTIST, rather than the reader. Give the artist all the information they need – clear descriptions of the characters, what they are doing, saying etc. Only one action will fit in a panel and if it’s not in the script, it won’t be on the page! The writer must also be mindful of the Colourist and Letterer – how will they capture the mood, dialogue and ancillary text required to tell the tale? 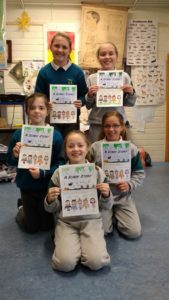 Motivated by the group, I gave a comic book course in Scoil Náisiúnta an Chroí Naofa, Glounthaune NS, where some pupils from 4th and 5th class collaborated on a Christmas story featuring naughty elves, their school play and even Donald Trump! 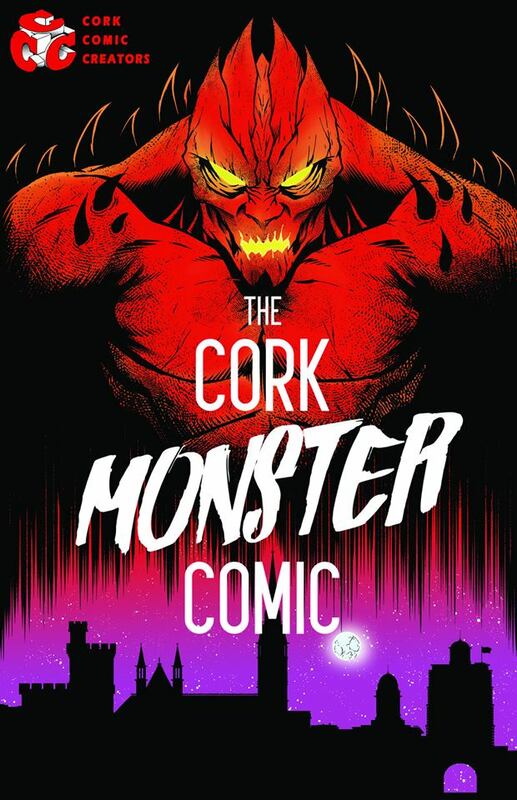 Meanwhile, the Comic Creators planned an anthology to coincide with the Cork Shandon Dragon Festival this Halloween. Keen to get involved, I volunteered a story and thought a Halloween type tale would also work well with my comic book class. 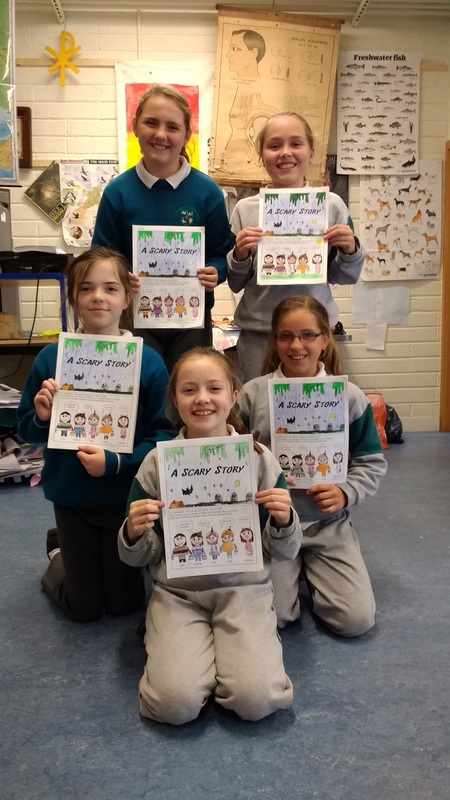 Once again, another comic book course in Glounthaune NS culminated in a 4 page illustrated story from five pupils in 4th class. 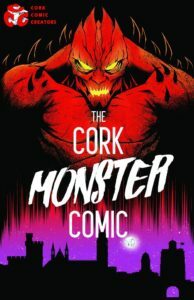 Our initial ‘Scary Story’ evolved into a Trick or Treat tale ‘Curse of the Cupcakes.’ Our story was accepted and will be published in ‘The Cork Monster Comic’, which will be launched on Halloween night at the Dragon of Shandon Parade in Cork City! In addition, I wrote a story entitled ‘Crazy Cork Celebs’ which will also feature in the anthology. Initially I’d hoped to illustrate my own story, but in the interest of sharing the workload and involving as many members as possible, it was decided to pair artists and writers to collaborate on the stories chosen for the anthology. Cork based artist Keith Kennedy did an amazing interpretation, capturing celebrities with Cork connections like Graham Norton, Rob Heffernan, the O’Donovan rowing champions, Pat O’Connell (protecting the Queen from a terrifying eel), Bruce Springsteen and Melania Trump (even if she hasn’t yet graced Pana). A skeletal Simon Coveney and vampire-like Leo Varadkar also make a frightful appearance! During the month of October, The Cork Comic Creators are holding an art exhibition entitled ‘Making Comics’ in the Cork County Library, County Hall, Carrigrohane Road, Cork, in conjunction with the Childrens’ Book Festival 2017 and Cork County Library & Arts Service. It features examples of comic and graphic novel projects by Cork artists Alan Corbett, Damian Duncan, Hayley Mulcahy, Alice Coleman, Eoin Coveney, Keith Kennedy, Brendan O’Connell, Fiona Bonniwell and Kevin Keane, and shows the various stages of the process of creating a comic from initial inspiration to final print. I, too, will be giving courses for any budding comic book artists in writing and illustrating a Harry Potter-themed story during the midterm break: Oct 31st & Nov 1st in Midleton Community Centre, and on Nov 2nd & 3rd in both Youghal Community Centre (10am) & The Pike Hall Glanmire from 2pm. See FB www.facebook.com/frazzledmammycork/ or contact 087 6684021 for further details. So this Halloween, be prepared to be scared by Cork Monsters or whisked away on a Hogwarts Adventure through the imaginative world of comics!